بغداد/البغدادية نيوز..اكدت قيادة العمليات المشتركة،اليوم السبت،ان طائرة هليكوبتر سقطت اثناء اداء مهامها نتيجة خلل فني في نهر دجلة بالقرب من مكيشيفة شمال سامراء. وقالت الخلية الاعلام الحربي التابعة لقيادة العمليات المشتركة في بيان تلقت /البغدادية نيوز/ نسخة منه،ان "البحث لازال جاري من فريق الإنقاذ للشرطة النهرية لمعرفة مصير طاقم الطائرة التي سقطت شمال سامراء". وكشف مصدر امني اليوم السبت، لـ/البغدادية نيوز/،عن "سقوط طائرة مروحية "هليكوبتر" في نهر دجلة بمنطقة مكيشيفة شمال سامراء". I have read that it was yet another IA-407. I believe it should be the 3rd or 4th we've lost so far. أكد المتحدث باسم وزارة الدفاع، العميد تحسين إبراهيم، اليوم الثلاثاء، أن طيران الجيش نفذ اكثر من 800 طلعة في الموصل اسفرت عن مقتل نحو 1000 عنصر من (داعش)، وفيما أشار الى تنفيذ طائرات القوة الجوية 117 غارة اسفرت عن مقتل اكثر من 250 عنصراً بـ (داعش)، اشار الى ان قاعدة القيارة جنوب الموصل ستستقبل طائرات مقاتلة قريباً. وقال العميد تحسين إبراهيم خلال مؤتمر صحافي حضره المتحدث باسم العمليات المشتركة العميد سعد معن والمتحدث باسم التحالف الدولي العقيد جون دوريان، وعدد من القادة الامنيين، في قضاء مخمور وحضرته، (المدى برس)، إن "قطعات الفرقة المدرعة التاسعة التي حررت العديد في الساحل الايسر رغم وجود المدنيين وقامت بأعمال بطولية رائعة ورغم تعرضها لخسائر في الارواح ولكن آثرت على نفسها الاستمرار بعملية التحرير مع تواجد المدنيين". وأضاف ابراهيم، أن "طيران الجيش نفذ اكثر من 880 طلعة ما بين 420 طلعة قتالية و460 نقلاً ودعماً لوجستياً، دمر خلالها 21 عجلة مفخخة و16 دراجة نارية و55 وكراً وقتل اكثر 994 ارهابياً ودمر 9 عجلات تحمل احادية وقتل 7 قناصين ومدفع 23 ملم عدد 8". وتابع ابراهيم، أن "طائرات القوة الجوية تقوم بجهد مضاعف من خلال تغطية الزيارة الاربعينية"، مبيناً انها "نفذت 117 ضربة جوية واكثر من 215 طلعة لنقل العتاد والسلاح، لقوات الفرقة المدرعة التاسعة والـ15 وألـ16 بالمحور الشمالي واسفرت عن مقتل اكثر من 250 ارهابياً". واكد ابراهيم انه "قبل بدء العملية هناك تنسيق عالي بين القوة الجوية وطيران الجيش والقطعات العسكرية"، لافتا الى، ان "قاعدة القيارة هيأت واستخدمت الآن طائرات النقل والنقل المتوسطة وفي القريب العاجل ستشهد القاعدة هبوط طائرات مقاتلة علماً أن طائرات القوية الجوية تقوم بتقديم الكثير من الدعم لقطعاتنا العسكرية". 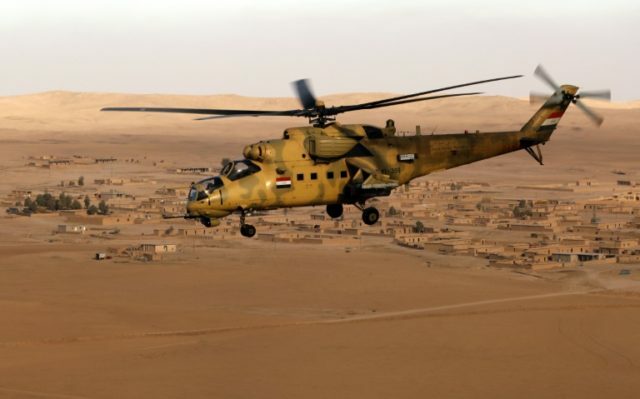 Qayyarah base (Iraq) (AFP) – Iraqi army pilot Hossam Jassim banked his helicopter sharply to the left as a Russian-made Mi-35 gunship flying alongside unleashed a missile at a suspected Islamic State group target. An explosion flashed in the desert village below and a huge plume of sand and dust rose into the sky. Jassim gave a thumbs up. “It was a pickup truck with a heavy machine gun,” he said later as he emerged from the cockpit at Qayyarah base, around 50 kilometres (30 miles) south of jihadist bastion Mosul. “There were about 10 fighters,” he said. Down on the ground Iraqi forces are battling to wrest back Mosul, tightening the noose in the surrounding desert and grinding their way street-by-street through residential neighbourhoods. Meanwhile, in the skies above there is a wide array of hardware backing them up. Dominating attention have been the jets, drones and helicopters from the US-led coalition of foreign countries that has been pounding IS with its awesome firepower. But, in its shadow, Iraq’s fledgling aviation has also been playing its own part — carrying out strikes with far more limited resources to back up its troops. Army pilot Golan Salim looked out at the roughly dozen helicopters — a mixture of Russian Mi-28 and Mi-35, American Bell armed reconnaissance choppers and European EC635s — resting on the tarmac at the Qayyarah airbase. That morning he said he had flown a mission to take out a group of IS fighters with rocket-propelled grenades. Salim said that the previous day he had to take evasive action as he faced machine gun fire from the ground. Despite increasing efforts to weaponise drones, the jihadists are far from threatening the air dominance of their opponents. But they have put up other obstacles. Billowing in the middle distance are giant black clouds of smoke from oil fires that IS lit back in August to obfuscate their retreat as they were pushed from the area. The large numbers of civilians that remain inside Mosul and the towns around still under IS controls have also placed major restraints on the air campaign. The United Nations has said the jihadists have forced tens of thousands of locals to march back with them as human shields. Iraq’s air capabilities were wiped out during the US-led invasion of the country in 2003, and have been rebuilt from scratch since then with many of the pilots trained by America. The pride of its air force is a batch of F-16 jets supplied by the US that have bombed IS targets around Mosul — but much of the air power lacks precision weapons. During its campaign against IS, Iraq has previously been accused of using indiscriminate barrel bombs and the US-led coalition has also killed civilians. But army aviation pilots insist that they are doing everything they can to avoid civilian casualties. In the five-week old Mosul offensive, their action so far has focused on sparsely populated desert areas outside the city. “It puts limits on our operation,” Major Muthanna Hanun said. In terms of the division of labour, the army aviation pilots said they can usually deal with most of the targets. But for larger objectives or when there is a threat from the ground that requires bombing from greater distance they turn to the coalition. “If we don’t have the capabilities to deal with it then the coalition is called to handle it,” Hanun said. The army aviation is under army command and has lighter aircraft, while the air force is a distinct structure boasting greater firepower, including US-made F-16, Russian Sukhois and Czech Aero L-159 fighter jets. According to defence ministry spokesman Tahsin Ibrahim, army aviation helicopters carry out 60 to 70 sorties a day across the Mosul battlefield. For the forces on the ground, army aviation support is proving vital to counter the waves of suicide car bombs IS unleashes against their positions. Federal police general Mohieddin Jawad sits in a cabin by the airfield that serves as a rudimentary coordination centre. “Fifty percent we rely on the army aviation and fifty percent we rely on the troops on the ground,” Mohieddin said.